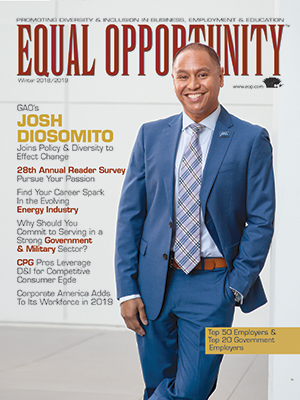 Equal Opportunity Magazine, launched in 1968, is a career-guidance and recruitment magazine offered at no charge to qualified African American, Hispanic, Native-American, and Asian-American college students and professionals in career disciplines. Equal Opportunity empowers readers to move ahead in their job search and/or current workplace environment. This magazine reaches students and professionals nationwide at their home addresses, colleges and universities, and chapters of student and professional organizations. If you are a student or professional who is a member of a minority group, Equal Opportunity is available to you FREE! Knowing how to compete and win in today’s strong job market is key to success. The U.S. economy keeps strengthening, and the job market is robust for all that seek a job. In fact, the U.S. Bureau of Labor Statistics (BLS) projects in its Employment Projections report for 2016 to 2026 released earlier this year that overall employment will grow 0.7% annually for that 10-year span. In contrast, the decade prior (2006 to 2016) only saw a labor growth rate of 0.5% annually, mainly due to the depressed hiring from the Great Recession. Furthermore, in just the last two years alone, more jobs have been added to the economy, in many different sectors and industries. This comes as Fortune 500 corporations and large government agencies continue their laser focus on diversity and inclusion at every level of their organizations. They’re seeking a varied workforce and recruiting from a widely diverse talent pool that yields them greater innovation, a unique mix of thoughts and ideas, increased productivity and a competitive edge in a global marketplace. It’s clear that more opportunities are opening up than ever before for job seekers with diverse backgrounds and experiences, so it’s with that in mind this year’s Annual Career-Planning Guide focuses on helping you to establish an enterprising edge in the job market, and to leverage your skill set for success now and into the future. The tips that follow will help you choose your career path, recognize and combat career fear, talk like TED speakers and ask for a pay increase. We also reveal the best jobs and examine the job market. Millions of Millennials born since 1980 are in the midst of paving their professional paths. And now the oldest of Gen Z born since 1995 are starting to do the same. They’re choosing careers, earning their educations and deciding which direction their career path will take. What they both care about when it comes to choosing a professional path differs somewhat from prior generations. Specifically, in terms of Millennials, nearly 60% find work-life balance to be crucial, according to Gallup, and they believe it’s important to have a job that promotes their well-being. As Millennials, they want to make a difference in the world, and they want to enjoy what they spend their time doing. It’s a generation that largely values experiences over things they can purchase, and a career is an experience that is important to them. Defining well-being, Gallup found what’s most important to Millennial career seekers includes liking what they do and having a sense of purpose. •	Determine Your Passions. Experiment with some jobs and hobbies to see what type of career gets you excited. While you may not always completely follow your passion when choosing a career, it’s a good idea to make sure you enjoy what you’ll spend your career doing. •	Look Beyond Demographics. Don’t worry about who has historically dominated the field. That shouldn’t stop anyone from going forward and seeking a career in a particular field. Just because men or women have always done a particular job doesn’t mean that you can’t change that. •	Get the Skills You Need. It takes training and experience to become an expert at something. Put in the time to get the education and training you need to go forward. •	Network with Successful Professionals. Whether they’re in the same field or not, you can learn a lot from them. If you can find a mentor in the field, then be sure to take advantage of all you can learn from that person. •	Avoid Being Caught Up by Challenges. If a challenge arises, then find a solution to find your way around it. For every problem there’s a solution you can use to find your way around it. Then keep going. See challenges as a test of your commitment to reaching your goals. •	Be Realistic. Realize no matter what career path you choose, you’ll start somewhere near the bottom. Don’t let that bring you down. See it as a stepping stone and start using what you learn there to move up the ladder. •	Become a Positive Thinker. If you’ve been a pessimist in the past, then now is the time to leave that behind and start using the laws of attraction to help bring you the things you want. Focus on being positive and striving to reach your goals. Choosing a career path, and seeing it through is a challenging and exciting time of your life. There are so many possibilities and options, you just need to decide what you want to do and start marching toward it. It’s well worth it, and you’ll be happy once you get there. About the Author: Wright, jamiewrightesq.com, is a Millennial attorney who specializes in Millennial issues, government affairs, crisis communication and conflict resolution, among other areas. A graduate of the University of California, Berkeley, she practices law in Los Angeles, CA. She’s also a partner in the Millennial Government Affairs group. Plus, she’s a political pundit and crisis communications expert.